Battling crime, blight, poverty and other challenges, residents of Johnston Square knew they had a potential weapon in Ambrose Kennedy Park. But that weapon had been engulfed by weeds, trash and darkness for so long that some residents were unaware that there even was a park. Community clean-ups could only go so far when pleas to the city to cut the grass, fix divots in the basketball court, install outdoor lights and build restrooms went unanswered. That’s about to change as the Department of Recreation and Parks and the Parks & People Foundation undertake a $1.2 million upgrade of Ambrose Kennedy, supported by a host of city, state, federal, corporate and foundation funders. “We pray the park’s reopening will be seen as a symbol of better times and brighter days for all,” said Rev. Ray Anthony Cotton, pastor of Mount Sinai Baptist Church, at yesterday’s groundbreaking. Plans include a swimming pool and splash pad, two new basketball courts, flowering shade trees, walking paths, a landscaped amphitheater and an open grass playing field. BGE has promised to donate lighting. Also included in the package: bathrooms with changing areas. Currently, the only restroom for users of the park’s small pool is a portable toilet, which often could be found toppled on its side. As dignitaries gathered for the groundbreaking, workers could be seen clearing land on the 1.75-acre parcel located between Latrobe Homes and Johnston Square Elementary School. The project is expected to be completed by late spring or early summer, officials said. But according to Parks & People project manager Steve Preston, that’s just Phase I. 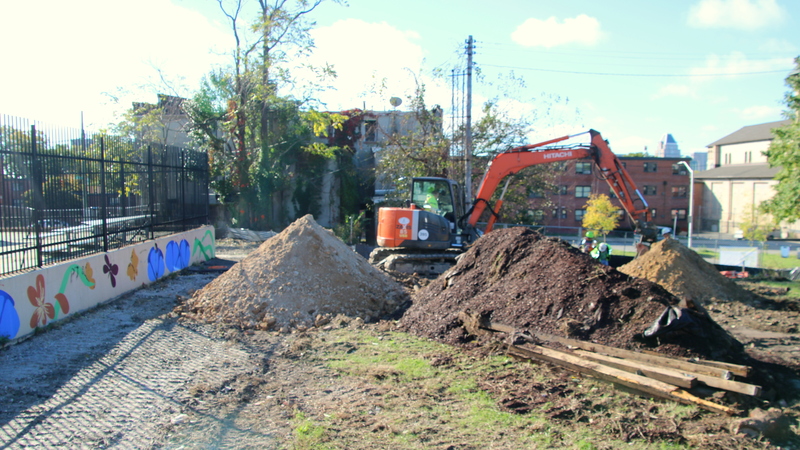 Eventually, when the city acquires and demolishes adjacent properties on East Chase and Valley streets through the state’s Project C.O.R.E., the park will double in size, Preston said. 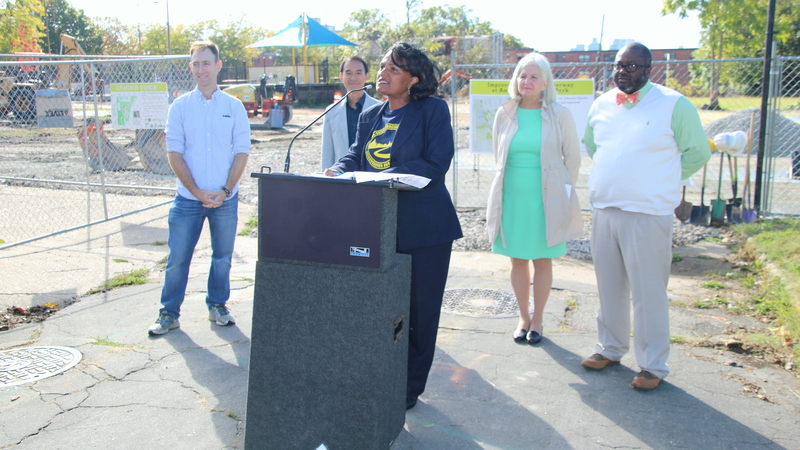 “We want to create a quality park – we see it as a model,” he said, adding that the partners hope it will anchor a number of redevelopment efforts in the area. The non-profit TRF Development Partners, for instance, is overhauling 30 rowhouses for families that earn less than the median area income. On nearby Greenmount Avenue, the venerable Yellow Bowl restaurant is about to open under new ownership. 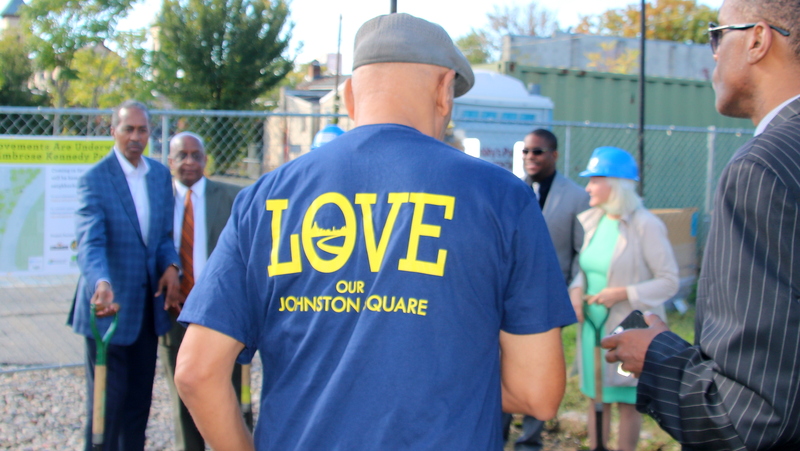 “We really think it’s going to be the heart of Johnston Square,” said Parks & People CEO Lisa Millspaugh Schroeder. The involvement of the faith and community group BUILD was key, said Hammond, who has lived in Johnston Square for more than 30 years. 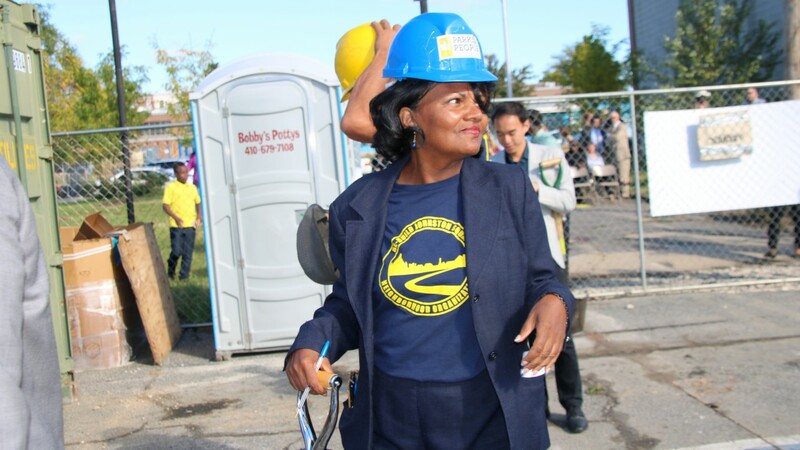 BUILD and the veterans’ group, The Sixth Branch, were early supporters, organizing clean-ups and repairs. The Robert W. Deutsch Foundation was also instrumental. Hammond and her neighbors started Rebuild Johnston Square four years ago hoping to make the community more livable and to give young people something to do.